How It Works – Inovestor Inc. Better Results And Less Hassle. 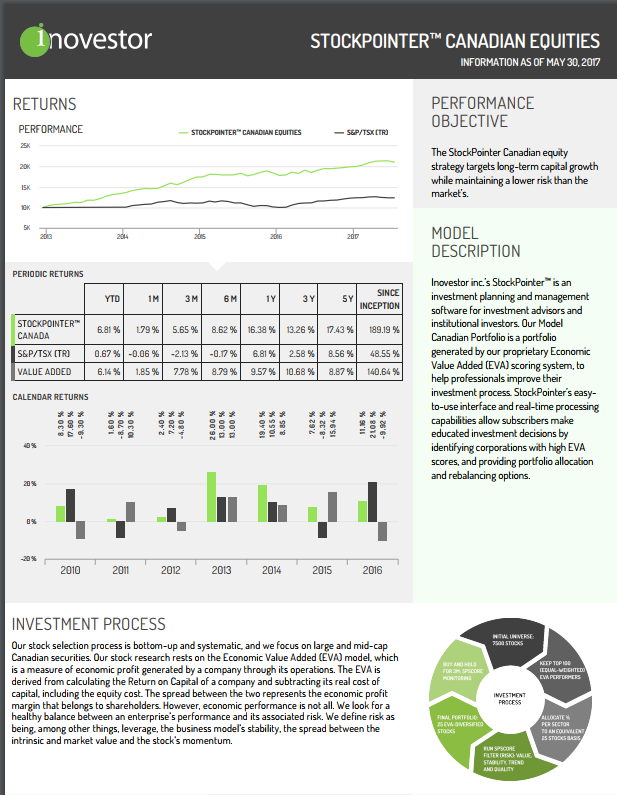 Our Canadian model portfolio has generated annualized returns of more than 6.8% over the TSX Total Return. In fact, it generated excess returns in over 80% of the quarters since inception. From our scorecard, you can analyze a company in less than one minute. 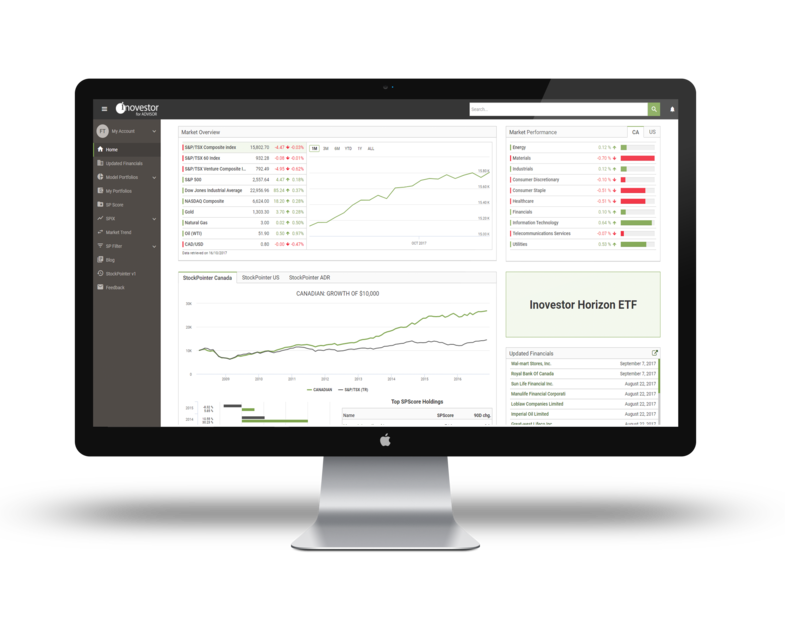 Inovestor For Advisors is ideal to discover attractive investment opportunities. With our guided portfolios, you receive personalized monthly newsletters that can be used to keep your clients up to date. In addition, you receive quarterly reports of portfolio rebalancings. With a single click, find companies that diminish the returns of a portfolio and find alternative investments. StockPointer is a 12 factor model that your customers understand. Using the economic profit theory, StockPointer finds quality companies trading at reasonable prices. Get access to phone support. Our account managers and product specialists address any questions you may have. The StockPointer methodology has generated industry-leading results for close to 20 years. Rely on Inovestor for Advisors for your stock picks and watch your margins take off into new levels of profitability. You’ll be amazed to find out how much your money’s worth. in 2008 and followed StockPointer's model portfolios†. Whether you need to answer an ad-hoc request about an unknown company from one of your prospects or you need to find an alternative investment, you can consult one of our different reports – from Scorecards to full-fledged reports. Access a broad list of material when you follow our model portfolios. On a bi-monthly basis, use our material to engage with your customers. Increase communication with customers with content such as trading ideas, rebalancing comments, and market summaries. 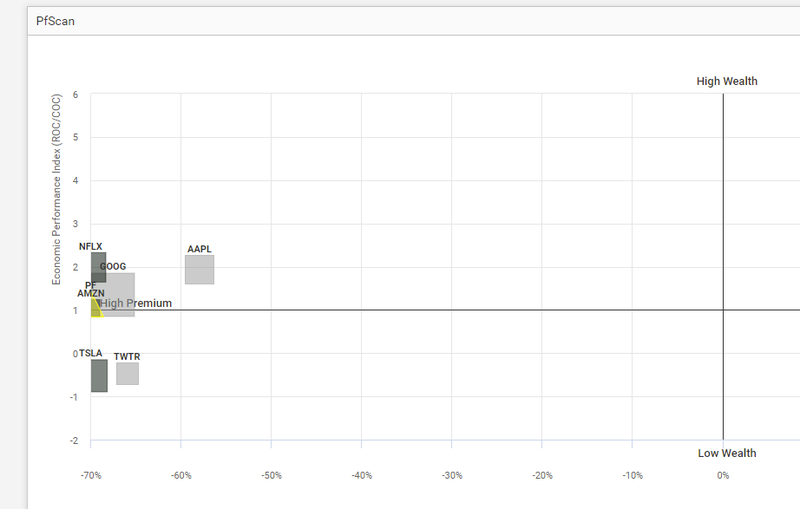 When you analyze a prospect’s holdings, would you like to have a visual aid that displays graphically its investments and identifies the bad apples? Our portfolio scanner does just that while assisting you convert a prospect to a customer. It identifies stocks that under perform. And even if you invest solely in Mutual Funds it allows you to monitor investments and decide when to divest. Y Axis The vertical axis represents the how much wealth is created to the shareholder, Anything above 1 is good, the higher the better. Under 1, the company generates less than the cost of capital and below 0, it actually destroys wealth. X Axis The horizontal axis represents the how expensive is the stock, value stocks are generally located to the right and growth stock to the left. Apple Apple is an expensive stock but generates highest wealth of all theses stocks and is trading at a higher discount than the other ones. Twitter and Tesla Twitter and Tesla are both destroying wealth to their shareholders, and are extremely expensive. Most of the time, stocks in these area tend to perform poorly on the long run. Google and Amazon These companies are generating wealth for their customers and are trading at a high premium. Subscribers have access to many more features. 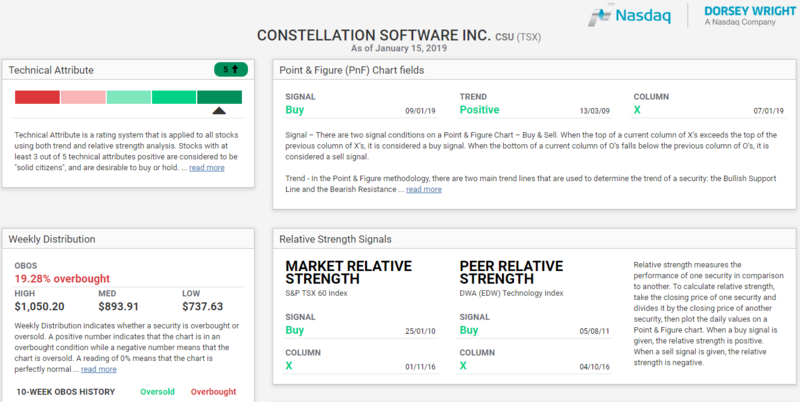 Access information on portfolio rebalancing, market review, and in-depth company analysis. If you like our model and you want to simplify your process, our SMA service will save you time. We can help you with any specific task - from automating your investment model to creating customized filters. Our team of specialists can assist you build your factor based model. † Disclaimer. 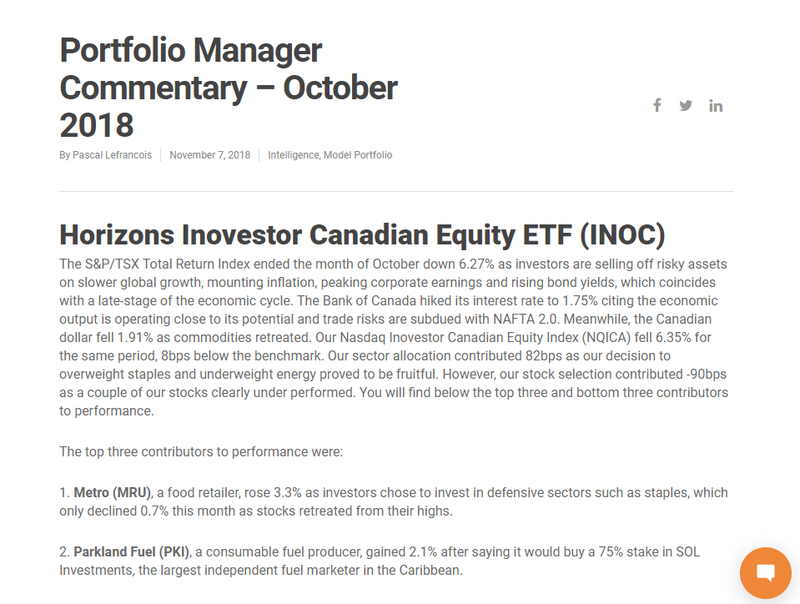 This is just for indication purposes and is based on a initial investment on April 2008 for the Canadian and June 2008 For the US and Global and all dividends are reinvested quarterly. The initial asset allocation is a 60/40 and portfolios are not re balanced. The initial country allocation is 30% Canadian, 20% United States and 10% Global. The StockPointer model portfolios include trading fees.